It is 1882 and the Old Ones are already here. They arrived seven hundred years ago and have been ruling the planet ever since. The majority of people just get on with their lives, accepting their monstrous rulers. However, there is a growing band of revolutionaries who wish to free mankind from their slavery. These freedom fighters call themselves the Restorationists. A secret war has already broken out between the Restorationists and the forces loyal to the Old Ones. The invention of dynamite has changed the balance of power and a lone assassin now has the capacity to destroy an Old One. In this shadow world of assassins, informers, police agents and anarchists nobody is quite sure who is who and which side they fight for. 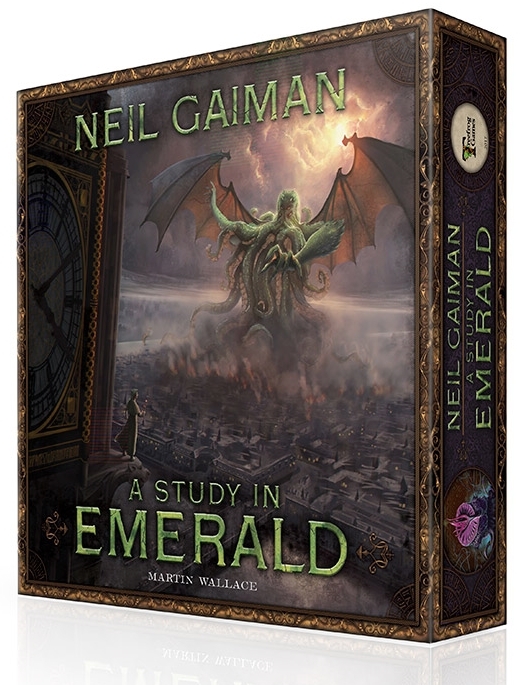 The game A Study In Emerald draws its central plot from the award winning short story penned by Neil Gaiman, in which the worlds of Sherlock Holmes and H.P. Lovecraft are combined to telling effect. However, to create a world detailed enough for players, much has been added from real history. The nineteenth century was a time of unrest, with many colourful characters fighting both for and against the authorities. The second edition of A Study in Emerald is updated and modified with all new artwork by Ian O’Toole and Tatiana Kuzilova and features a new streamlined set of rules.